Aesthetics of Absence presents a significant challenge to the many embedded assumptions and hierarchical structures that have become ‘naturalised’ in western theatre production. 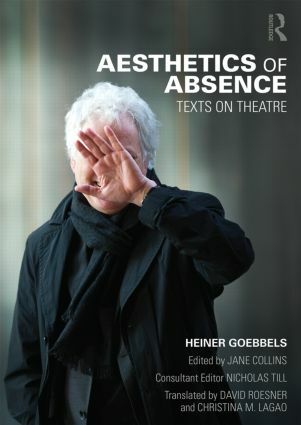 This is the first English translation of a new collection of writings and lectures by Heiner Goebbels, the renowned German theatre director, composer and teacher. These writings map Goebbels’ engagement with ‘Aesthetics of Absence’ through his own experience at the forefront of innovative music-theatre and performance making. "This book will have a wide appeal for scenographers, designers, theatre makers, students and academics who are interested in the interplay of theatre objects directly from the perspective of an exemplary practitioner of the form. […] a welcome and stimulating perspective." "A significant contribution to shifting the margins and the centre of the discourse on practice." Heiner Goebbels is a professor at the Institut für Angewandte Theaterwissenschaft of the Justus-Liebig-University Gießen, President of the Hessische Theaterakademie, and Artistic Director of the Ruhrtriennale – International Festival of the Arts.